My jaw dropped at the first frame of Mad Max: Fury Road, and it did not close again until the credits rolled. What George Miller and his extraordinary team have accomplished here is nothing short of a full-blown action masterpiece. A pure expression of cinematic vision unlike anything mainstream cinema has offered in recent memory, Fury Road is among the most ambitious, strange, and accomplished Hollywood blockbusters to come along in my lifetime. Shot after shot, sequence after sequence, awe-inspiring image after awe-inspiring image, I can honestly say I have never laid eyes upon anything quite like Fury Road, certainly not in a mainstream American multiplex, and that is such an immensely rare sensation that even after watching the film, I can hardly believe it exists. Miller has masterfully blazed his own trail here, somehow convincing a room full of studio executives to lose their minds and give him an irresponsible amount of money to realize this incredible lunatic vision. 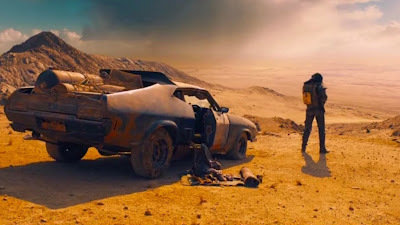 From the way it looks to the way it moves to the way it sounds, to how it crafts an archetypal story that simultaneously challenges the history of Hollywood genre representation, Fury Road is defiantly singular, and cinema is richer for its existence. Structured not in the typical three-act fashion of mainstream blockbuster spectacle, Fury Road is downright symphonic. It is arranged in movements, some long and bombastic, others short and atmospheric, but all of it realized with the same lucid precision with which a composer would craft a great piece of music. The film is absolutely non-stop, with a sense of momentum that is positively intoxicating, and yet the pace remains engaging and varied, for Miller always crescendos towards the fortissimo of an elaborate set piece, and elegantly diminuendos down to pianissimo when required. There is absolutely a story being told here, and it is more thematically complex and suggestive than it may appear at first glance, but Miller tells it almost completely through action and movement, with virtually no formal exposition of any sort at any point in the proceedings. Miller wastes not a single shot or a single word from start to finish, the narrative carved straight down to bone and related as pure experience, and the utter precision of the intensely visual storytelling is evocative more of animation than it is live-action cinema (Miller reportedly storyboarded the entire film in lieu of writing a script, and it shows). So too does Miller’s approach to character thumb its nose at the history of classical and modern Hollywood cinema. There are some truly great character creations on display here, and a number of performances that are remarkably realized in a number of ways, and yet Miller’s focus isn’t devoted to the foregrounding of character and psychology as most mainstream pictures are. He is much more interested in tone, imagery, atmosphere, and world-building, in kinetic action and a joyous sense of immersive momentum. The characters exist as extensions of this world, not the other way around. 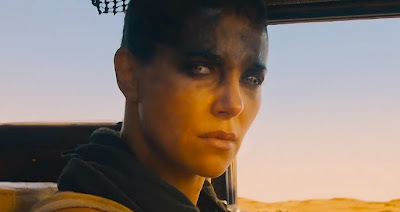 Max himself (Tom Hardy) has a brief internal monologue at the very beginning of the film, but after that, Miller is off to the races, and Max’s arc is seamlessly woven into his actions and those of other characters, like Imperator Furiosa (Charlize Theron), whose ceaseless devotion to her own cause is wordlessly contrasted with Max’s pathological focus on survival. A character may initially come into view as little more than a vocal piece of the film’s elaborate mise-en-scene, like the fanatic ‘War Boy’ Nux (Nicholas Hoult), and so gradually be developed and defined by his role in the action that, before we are even aware of it, we have invested in him as an integral part of the ensemble. Miller’s approach is such that when the final movement comes, and every characters puts their life on the line in one way or another to fight for what gives them meaning, it all genuinely matters, and it all has a weight that operates upon the viewer with unconscious intensity. Statements in the film are, again, made through action, and no declaration is more powerfully felt than Miller’s clear feminist undercurrent. Max may be the film’s ostensible protagonist, but Furiosa is the hero, and her goal – to liberate herself and the other oppressed women of her post-apocalyptic society – is the driving narrative force of the film. As a result, the majority of the active on-screen ‘heroic’ figures here are women, and that alone, in the context of the kind of story Miller is telling, resonates loudly against the tradition of feminine erasure in blockbuster action cinema. It is not a revelatory or necessarily ‘insightful’ message at the heart of the film, but then, Fury Road isn’t about messages. It is about experience, filtered through a pure and unique realization of archetypes, and that this experience is vocally inclusive and proudly opposed to subjugation of representation, is something quite remarkable indeed. 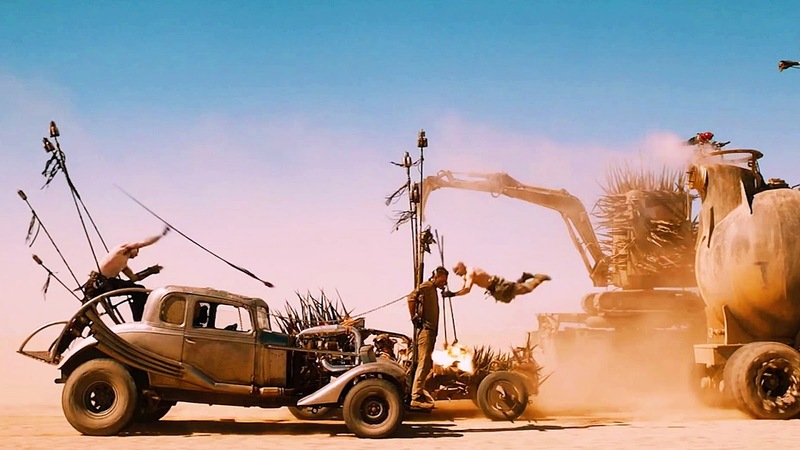 As a work of cinematic craftsmanship, Fury Road is simply unparalleled. Veteran cinematographer John Seale has captured the often haunting beauty of Miller’s world with the eye of a master, the colors and compositions consistently breathtaking. That this world is so overwhelmingly filled with miraculous sights to see is a testament to the tremendous work done by every other person operating behind the scenes. The sets, the costumes, the make-up, the cars…all of it is boldly unique, endlessly imaginative and all in service of a larger, unified vision of this world and its people and cultures. There are some downright crazy ideas on display here, some images and design choices so brazenly strange that they must be the work of a madman, but that madman has crafted this world with an internal logic and aesthetic order that is palpable in every frame. All of it, every ounce of effort, has gone towards expressing Miller’s vision – even the music, by Junkie XL, which is so good and so perfectly matched with the material that it is often difficult to discern where the general sound design stops and the score begins. The result is one of the purest auteur expressions I have ever seen in a major Hollywood release, and when all of these elements are working together at their fullest, during the impossibly elaborate set pieces Miller and company have achieved, the result is like having an out-of-body experience. Nearly every director working in America today, whether they have shown aptitude for action and spectacle before or not, could benefit from careful analysis of Fury Road, because Miller’s mastery of editing and visual geography is heads and shoulders above just about anything I have seen so far this century. He dreams big, planning sequences with more moving pieces than I can count, and yet the action is never even slightly incoherent, or anything less than fully, forcefully immersive. And he does all of it on moving vehicles, as smaller pieces in one feature-length chase. At a certain point, the man is just showing off. Yet nobody could deny Miller has earned the right. Mad Max: Fury Road is one for the history books, the kind of Hollywood spectacle scholars and film professors will pull out decades from now as a miraculous counter-example to the typical programming seen in this era. It absolutely should not be missed, and it should be seen and enjoyed on the biggest and brightest screen possible. This is a film worth celebrating, and the grand cinematic achievement of 2015 to date. Follow critic Jonathan Lack on Twitter @JonathanLack.